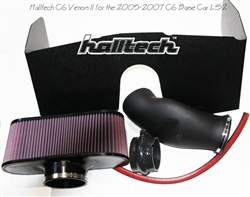 Halltech C6 Venom II is the direct replacement for the stock LS2 intake box. Bolt on 15 RWHP/12 lbs ft torque with the all new design. Now with a larger 106.7mm inlet and built in velocity stack, no other bolt on will make more power. This intake is made from the same mold as the Killer Bee II that dynoed +15 HP/+14lbs-ft. on the Katech Engine Development Superflow dyno. The same huge high flow K&N Filter will flow over 1250 cfm, and feeds over 900 HP easily. This system uses the stock wiring, and MAF sensor for direct bolt on power that will not void your warranty. The Halltech Beehive and HC.125 honeycomb flow straightener is included with purchase. No tuning required. MAF sensor not included. Not CARB legal.